Beds from Gautier are all about versatility. The designs, being both fun and functional, create not just a sleeping area but an extra dimension in the bedroom to cater to different needs. For rooms with limited space, the single Gautier midsleeper beds provide ample storage space. A storage bed not only provides an elevated sleeping area for your child but can include cubby holes, drawers and shelving to keep your child's belongings neatly tidied away. Consider a drawer underneath the bed that pulls out providing plenty of room for extra bedding or clothes. A mattress in the drawer turns it into a spare bed when your child's playmate stays overnight. Or go for a bed with shelving, cubby holes and drawers underneath. Your child will love climbing up a staircase-style ladder to get into bed. 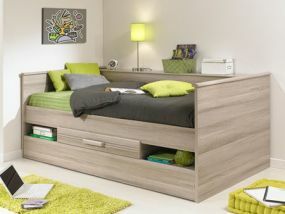 For your child's very own private study space, a desk incorporated into the bed frame is perfect. Whatever you choose, Gautier midsleeper beds will leave your child with a smile at bedtime.